Can’t Remove SlimCleaner Plus? This page includes detailed SlimCleaner Plus Removal instructions! SlimCleaner Plus is a legitimate app. It is designed to clean junk files and old registry entries. The app is advertised as a system optimizer that can help your OS run smoothly. And all this for free. It sounds almost too good to be true, doesn’t it? Well, what this app does not disclose properly are its hidden functions. SlimCleaner Plus is an advertising app. It floods its users with countless pop-ups and notifications. Thus, security experts categorize the utility as a PUP (Potentially Unwanted Program). Consider its removal. This app is a complete an utter menace. It follows programming to inject ads on every website you visit. You would notice that even web pages that used to be ad-free are now heavy on in-text and banner adverts. Pop-ups and notifications pop up every time you so much as touch your browser. Even your videos get paused for commercial breaks. And the most irritating part is that these numerous adverts burden your browser and make it prone to freezing and crashes. Do not put yourself through this torture. SlimCleaner Plus is not worth the struggle. Do what’s best for you and your system’s well-being. Remove the deceptive utility ASAP! How did I get infected with SlimCleaner Plus? Malvertising, software bundles, fake updates, corrupted links. There are myriads of ways for a PUP to reach your system. And SlimCleaner Plus uses all known tricks. This deceptive app lurks in the shadows and waits for you to let your guard down. It attacks when you least expect it. Its schemes, however, have flaws. The PUP needs you, the user, to approve its installation. There is no other way for the parasite to get installed. No permission, no admission. The app is bound to seek your consent. And it does. SlimCleaner Plus always asks. But it does so in the sneakiest way possible. If you let your guard down even for a second, if you don’t pay attention to the fine print, you are very likely to let the PUP on board. Do not make that mistake! Do not give into naivety. No anti-virus app can protect you if you throw caution to the wind. Only your actions can keep your device secure and infection-free. Even a little extra attention can spare you an avalanche of problems. Do not visit questionable websites. Download software and updates from reputable (preferably official) sources only! And forget about the “Next-Next-Finish” setup strategy. If available, use the advanced/custom option. Make sure you know what you install. Read the terms and conditions before you agree to them. If you cannot spare enough time to go through the whole document, scan it with an online EULA analyzer. Opt out of the installation if you notice anything suspicious! Why is SlimCleaner Plus dangerous? SlimCleaner Plus is a nightmare. As soon as this PUP enters your OS, corruption follows. The PUP makes a mess of your browsers’ settings. Chrome, Firefox, Edge, Opera. There is no immune program. The parasite invades your favorite apps and wrecks your browsing experience. This intrusive parasite doesn’t miss an opportunity to interrupt you with an ad of some kind. Whether you type a search query or browse your favorite website, the PUP is always there to annoy you. It opens pop-ups, loads commercials, displays banners. The more adverts you see, the bigger the chance you click on one. And when you do, it gets paid. That’s right! SlimCleaner Plus ruins your browsing experience and profits from that. And that’s not even the tip of the iceberg. The PUP doesn’t merely flood you with random adverts. This parasite customizes its ad selection. The PUP spies on you from the moment it invades. It studies your browsing habits and uses the collected data as a base for ad targeting. This scheme, of course, is nothing new. The problem is, however, that the PUP sells the collected information to unknown third parties. Do you feel comfortable knowing that some criminal might buy your personal information? Do not put up with this situation. Spare yourself many future headaches. Remove SlimCleaner Plus the first chance you get. How Can I Remove SlimCleaner Plus? If you perform exactly the steps below you should be able to remove the SlimCleaner Plus infection. Please, follow the procedures in the exact order. Please, consider to print this guide or have another computer at your disposal. You will NOT need any USB sticks or CDs. 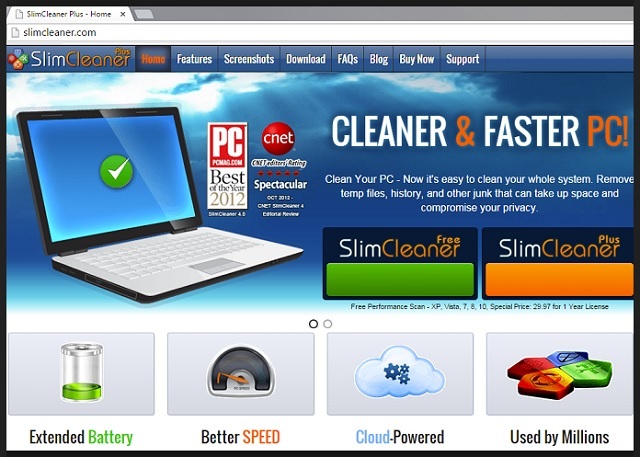 Locate the SlimCleaner Plus program and click on uninstall/change. To facilitate the search you can sort the programs by date. Review the most recent installed programs first. In general you should remove all unknown programs. Navigate to C:/Program Files and delete SlimCleaner Plus folder. Double check with any antimalware program for any leftovers. Keep your software up-to date! SlimCleaner Plus may have the ability to replicate itself, if not completely cleaned. This may require tracking down hundreds of files and registry keys. You can choose to use Spyhunter Professional Anti-Malware Program to deal with any infection that might be lurking along with SlimCleaner Plus!